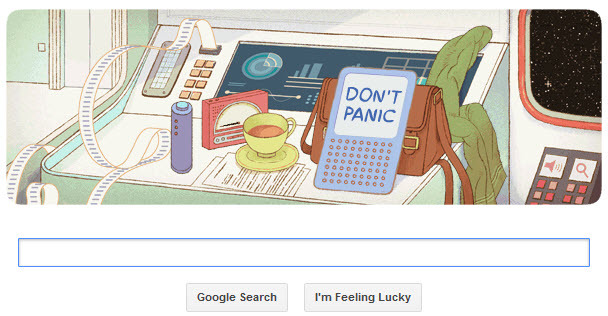 Google is celebrating Douglas Adams’s 61’st birthday with a new interactive google doodle on its homepage. Douglas Noel Adams (11 March 1952 – 11 May 2001) was an English writer, humorist and dramatist. He is best known as the author of The Hitchhiker’s Guide to the Galaxy, which started life in 1978 as a BBC radio comedy before developing into a “trilogy” of five books that sold over 15 million copies in his lifetime, a television series, several stage plays, comics, a computer game, and in 2005 a feature film. Adams’s contribution to UK radio is commemorated in The Radio Academy’s Hall of Fame.